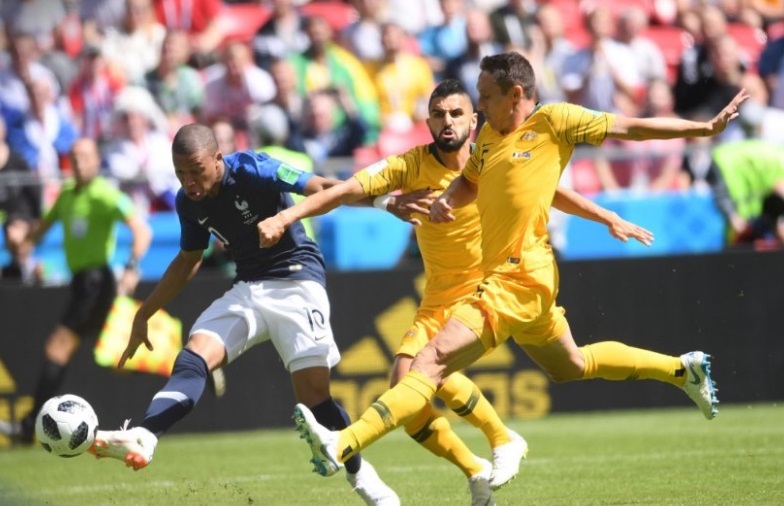 Australia’s Socceroos were for 80 minutes able to hold France, one of the tournament favorites, to a draw in the first match of this World Cup in group C, until the inevitable Paul Pogba broke the stalemate with a strike for France and put the final 2-1 score on the board. The match at certain points descended into a scrappy game in the Kazan stadium where neither of the other sides allowed the other many passes. It was clear from the beginning that Australia ware aiming for a draw in this game against the group favorite. But France came through in the dying moments of the game, and it was clear at that moment that Australia had pushed through the best of its forces. With France playing the day after Spain-Portugal served a truly astonishing first highlight of this World Cup and Argentina’s Messi being able to show his skills later today, the 2018 Russia tournament has now really started. As said, the matchup between Spain and Portugal yesterday brought a first footballing highlight to this World Cup, with superstar Ronaldo in an absolutely stellar role and three goals, immediately turning him into a very big candidate for the tournament’s top scorer title. Portugal scored first after only three minutes but saw Spain getting level after half an hour. Just before halftime, Portugal scored once more via Ronaldo after a fault from Manchester United keeper De Gea. After the break, Spain pushed and went up 3-2 until Ronaldo was fouled five minutes before the end just outside of the penalty box. With a fabulous free kick, he ended the game 3-3. That was infuriating to watch. Every time the Africa… I mean French put the pressure on, the Aussies keep passing the ball back to their side.